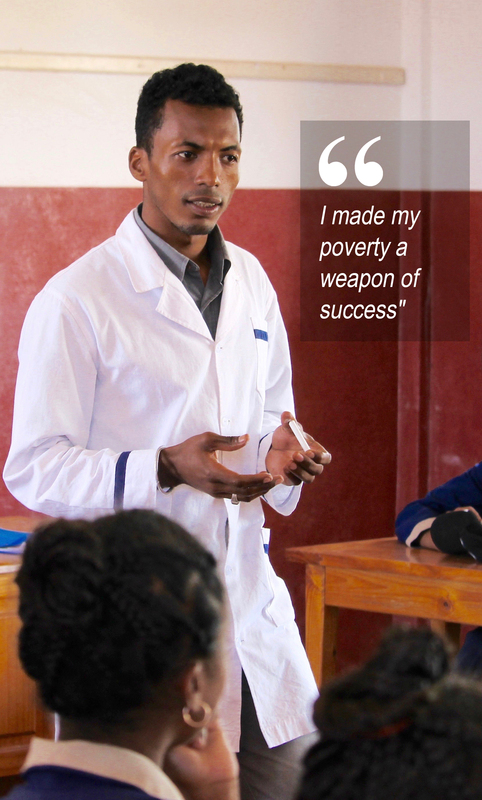 For the past 11 years, IECD and the Madagascan association PROMES have been combating school failure among young rural students in the region of Fianarantsoa by supporting them from junior school through to senior school with the CERES program. Mandimby is one of the students from the 2008 academic year. From the 1st year to the final year, the program’s personal and global support allowed him to successfully overcome the steps despite moments of doubt. Now, he wants to offer young people in difficulty the same chance as him. “I followed the Initial Teacher Training for junior school teachers, designed and coordinated by CERES since September 2014. I learned a great deal about child and adolescent psychology and all the skills needed to become a teacher. The training is also certified by the Institut National de Formation Professionnelle (INFP), which helped me to find work easily: in September 2016, I started teaching Madagascan in the CERES Preparatory Year. Find out more about the CERES program.